Now that you have learned the knit stitch, you are ready to move on to your next knitting challenge: the purl stitch. Don’t worry, its no more tricky than the knit stitch. 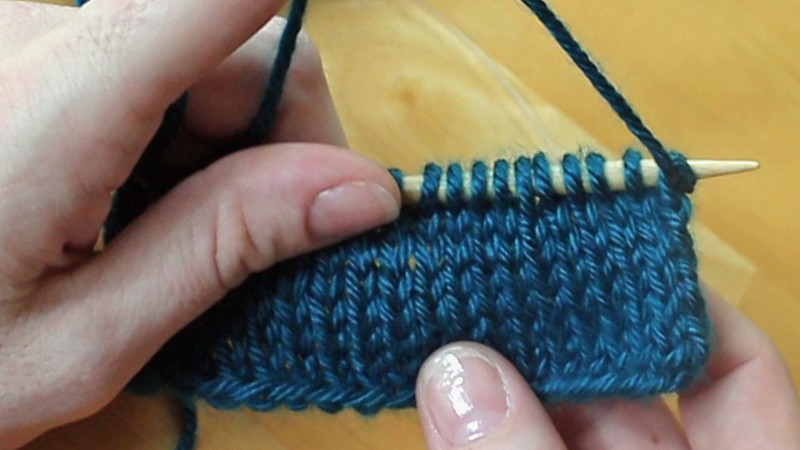 A purl stitch is essentially a backwards knit stitch. You’ll hold your yarn in front of your needles to create a “U” shaped stitch, which looks like a bump. If you make a knit stitch, turn it over: the back side of a knit stitch looks exactly like the front side of a purl stitch. If you were to purl an entire piece of knitting work, you would end up with a garter stitch pattern, just as you do when knitting with only the knit stitch. As you will soon see, combining knits and purls will allow you to create a lot of fantastic patterns and designs in your fiber art. The knit side of a pattern. Do you see the little Vs? The purl side. Look closely, and you’ll see little upside down “U”s on the bumpy purl side. When you knit, you hold the yarn in back of your work and create a flat “V” shaped stitch like the one shown above. When you purl, you hold the yarn in the front of your work and create a bump or a “U” shaped stitch. Learn more about what untwisted knit stitches should look like here. Below are both a video tutorial and written instructions for how to make a purl stitch in knitting. First, place the needle with your cast-on stitches in your left hand. Hold the yarn coming from your yarn ball in front of your needles. Don’t for get to maintain tension in the yarn as you would for a knit stitch. Insert your empty needle (right hand needle) into of your first cast on stitch from the back side of the work. Bring your working yarn down, towards you, over your needle. 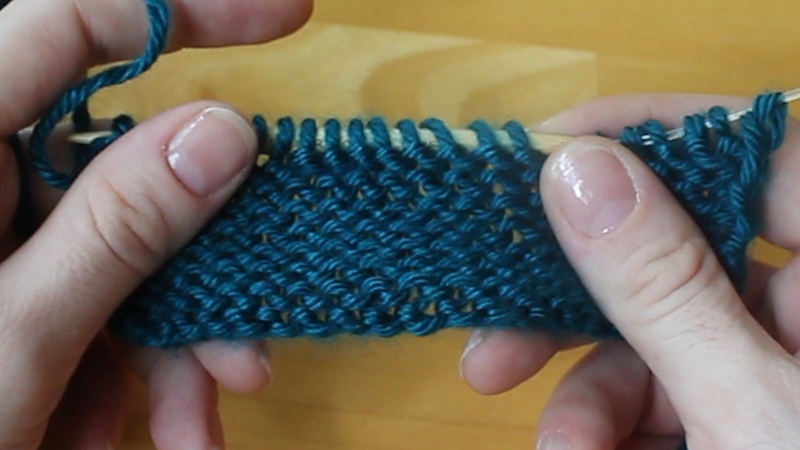 Pull the yarn with the right hand needle through the first cast on stitch from back to front. You have made your first purl stitch! Repeat this process until the end of your cast-on row. For purling practice, you can turn your work and continue purling until the end of the row. Repeat. Your result will be a garter stitch pattern that looks just like your garter stitch pattern made by knitting. If you’d like to make another scarf for practice, you can follow my free Easy Beginner Scarf Pattern, except you will need to replace all the knit stitches with purls. Need more help making the purl stitch? Ask in the comments below. Once you’ve learned to knit and purl, you’ll want to know how to spot common knitting mistakes. 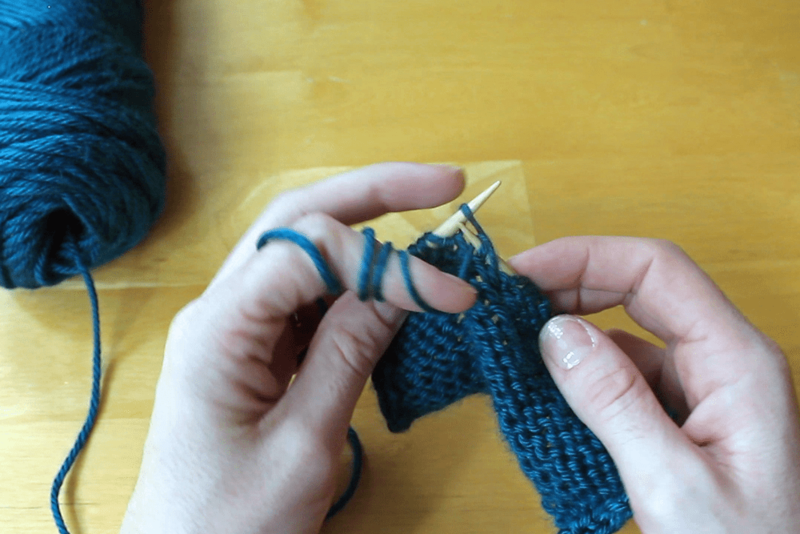 Go to the next learn to knit tutorial: spotting knitting mistakes.